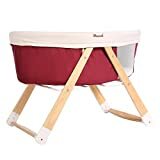 The C&AHOME multifunctional cradle offers baby with a soft and comfortable place to sleep at anytime: at home, on vacation, or visiting loved ones. The C&AHOME can be folded in order to be easily moved. This sleek bassinet is sleek, lightweight and stable. Soft materials, a comfortable mattress and mesh inserts for ventilation create a perfect environment for baby to sleep comfortably. 1.When the baby in the multifunctional cradle, the nurse must not leave! 2.To put the multifunctional cradle on the degree of the ground to use. 3.In the vicinity of the cradle, to avoid open flame and other powerful heat resources, such as electrical spark, gas flame and so upon. 4.Bearing children do not exceed 33lbs.